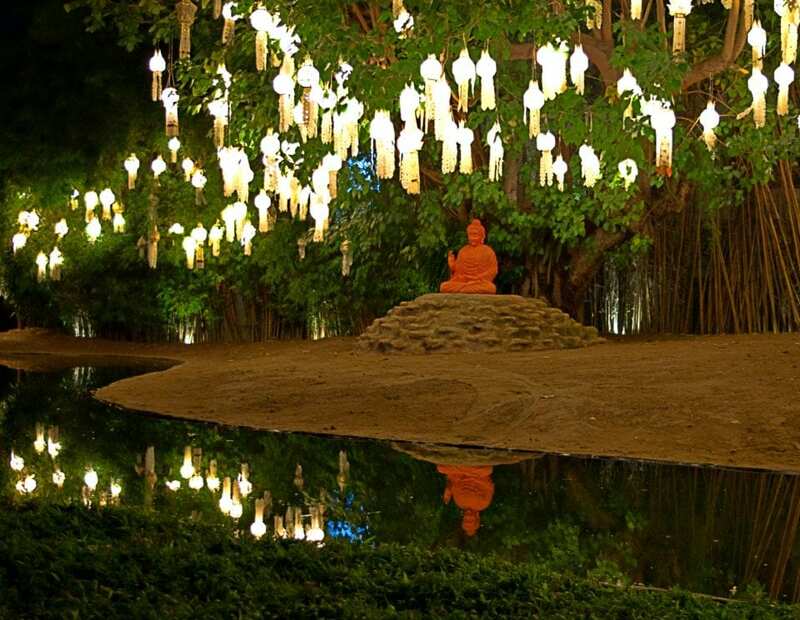 Thailand can be so much more than eating street food and hanging out at hostels. You do what you got to do to eke out an entire gap year on a student salary, but what about adult professionals who want to visit the Land of Smiles? 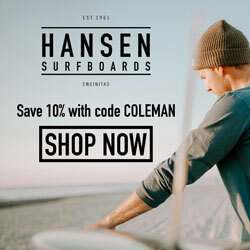 Through extensive research and over two months of Colemans in-country, we put together an eco-travel itinerary that is worth flying halfway around the world for on your precious vacation time. 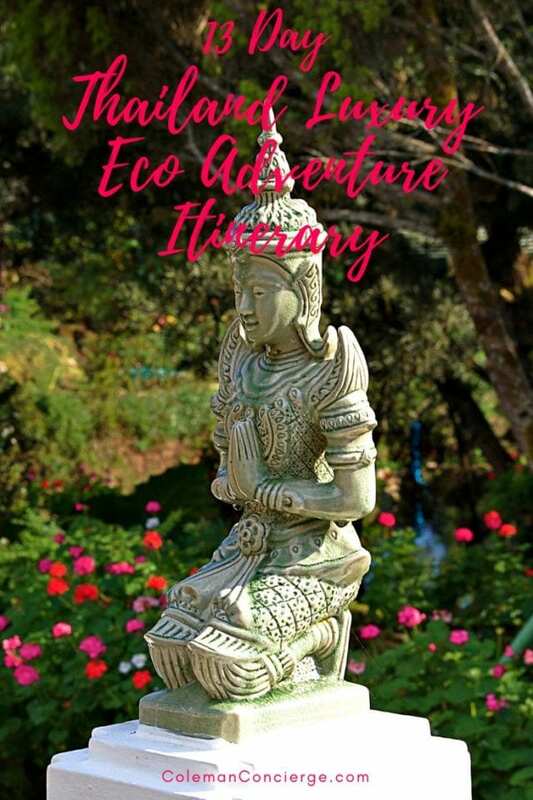 Instead of looking for the cheapest option possible, we leveraged Thai values to build an amazing adventure at a practical price. 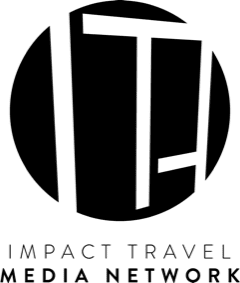 The entire 13-day trip costs about $3,000/person for all expenses in the country, not including airfare, which is an incredible value considering all that you will experience. 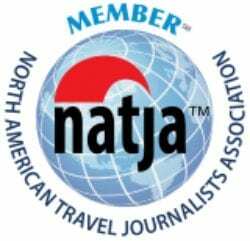 We focused on three core areas to plan this itinerary. First and foremost, finding the best, authentic, local, immersive, and ethical experiences. We have worked with these providers first hand and know how good they are. Secondly, we put together an efficient trip where almost all of the in-country transportation is done through the tour providers which means you can worry less and enjoy more.The efficiency also shows in the clean loop you’ll travel. Finally, we looked for completeness and diversity of experiences. There’s no way you can fit everything in, but we found a way to get a blend of city and countryside, mountains and beach, and everything in between. 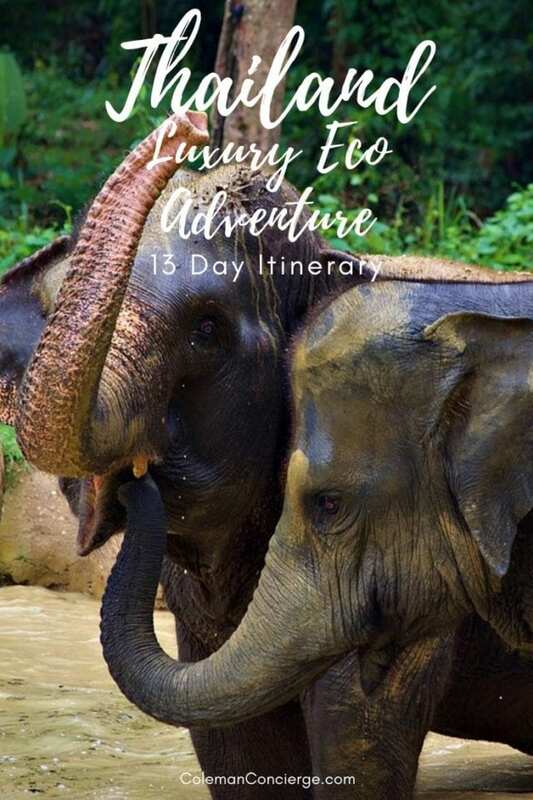 We hope you enjoy our 13 day tour of Thailand and get a chance to experience it for yourself someday. What to do in Thailand if you had more time? Bangkok is a fascinating but chaotic destination. 14 million people reside in the greater metropolitan area which underwent many waves of seemingly unregulated growth that left the city as a hodgepodge of shopping districts and architectural styles. 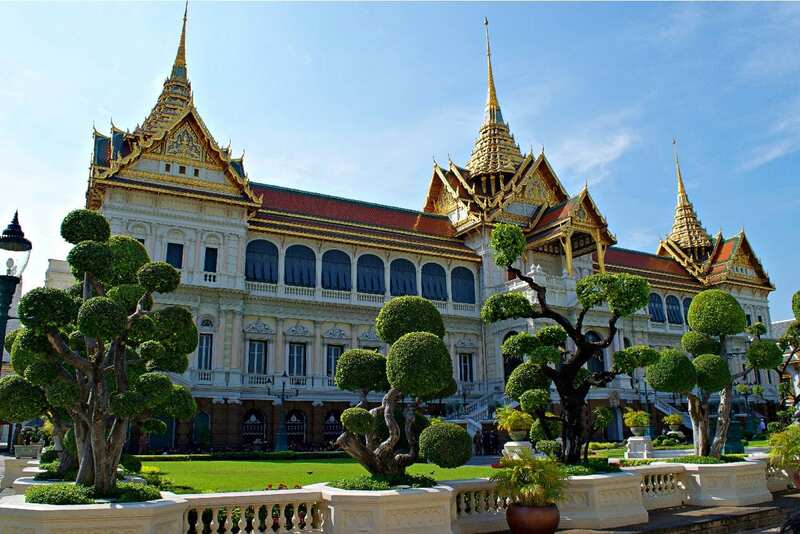 It’s sometimes hard to say where the “true” downtown can be found, but fortunately for tourists, historic Bangkok means Rattanakosin Island. 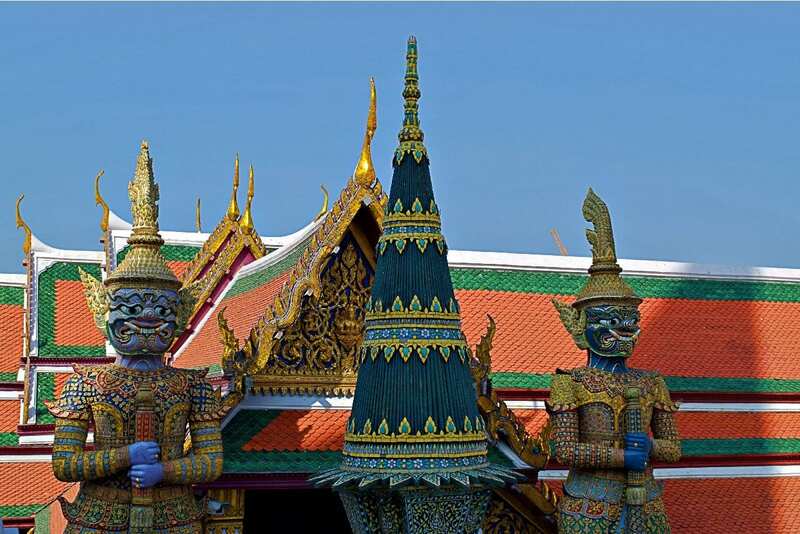 Most of the city’s famous landmarks like the Grand Palace, Wat Arun, and Wat Pho are here (or just across the river). For the first time visitor to understand Bangkok, let’s compare it to the more familiar Washington DC. Both cities started about the same time as newly christened capital, DC in 1791 and Bangkok (Rattanakosin) in 1782. DC, like Bangkok, has a large population of over 6 million people stretching out into the countryside of Virginia and Maryland. 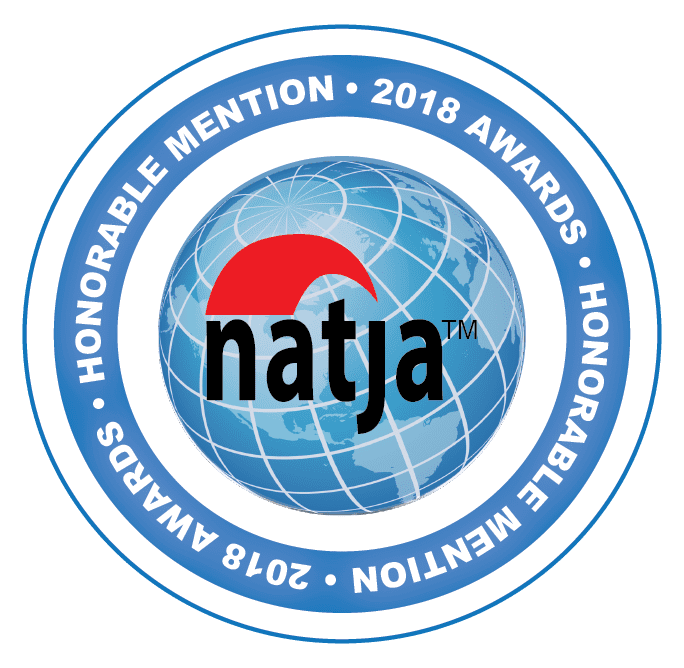 Despite the large population and geographic area, most people who go to Washington DC are content to stroll the National Mall and visit the monuments and museums. You’re sure to miss some dive bar in Georgetown or crab shack along the Chesapeake Bay seeing DC this way, but you’ll hit the highlights. In Bangkok, like DC you can spend anywhere from a day to a week playing tourist in the central hub. We found that one full day (and night) scratched our itch for Bangkok, especially if you stay on Rattanakosin Island itself. We enjoyed our stay at the Old Capital Bike Inn, where they feature guided night rides in Bangkok. Our daughter enjoyed the highly rated Jam Hostile. 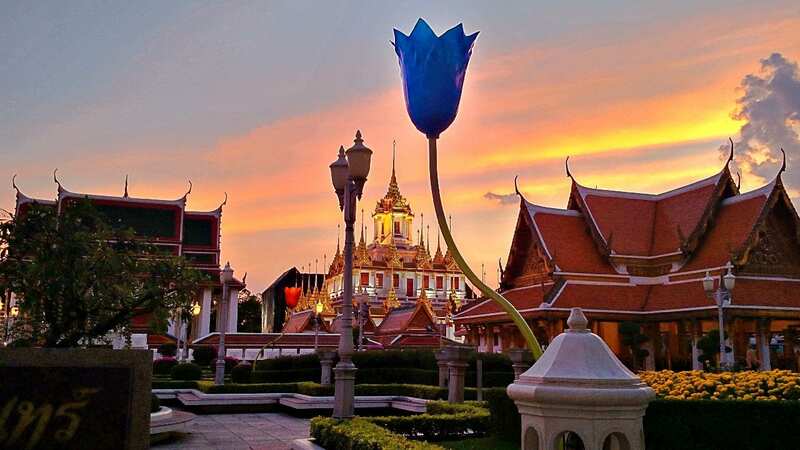 Either one gives you an ideal location to rest after your long flight, explore the historic flights, and slip in a little nightlife, be it the party scene on Khao San Road or a night ride around the temples. One night in Bangkok isn’t just a rocking song; it’s a way to see the “must see” list and then get out into the beautiful Thai countryside. When Grasshopper Tours picked us up from our Bangkok Hotel, we had no idea what we were in for. Ok, we knew that we would be biking about 50 miles a day for four days along the Thailand Coast. We didn’t expect four and five-star accommodations, unique dining at authentic local restaurants, and high-quality Thai massages every night (for only 30 baht). Blown away doesn’t begin to describe our experience. Neither one of us is going to win the Tour de France anytime soon, but you don’t have to be an extraordinary rider to enjoy this trip. Sherry Ott let us write a piece about facing our fears of biking in Thailand and how everything turned out ok. Long story short, every hour or so we found a new “hidden gem” point of interest to stop and explore like buying tropical fruit at a roadside stand or watching a small fishing fleet tend their nets after the catch. Since we were riding the back roads, these stops were geared for locals or maybe not even on the map at all. From local temples, we saw Buddhists, Hindus, and Thai Spiritualists worshiping side by side to a variety of gods and mused about how picking gods in Thailand is almost like picking your favorite NFL team. 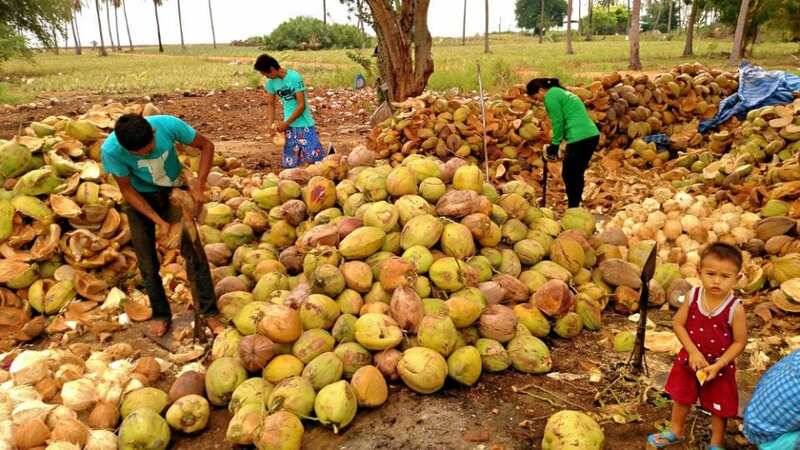 We have written a lot about our Thailand bike tour because there is really nothing like riding back roads on two wheels with a local guide to introduce you to a country and a culture. 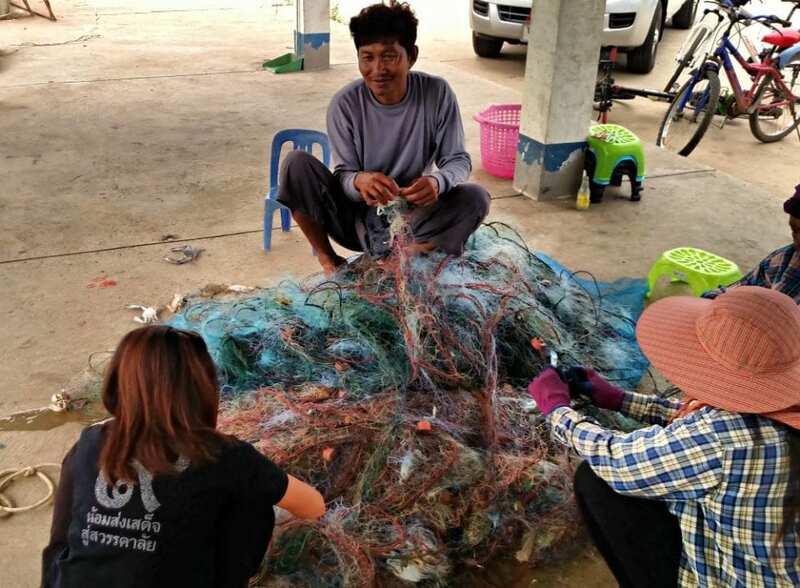 With a heavy heart, we said goodbye to our guides from Grasshopper as they dropped us off at the Chumphon Ferry. The bike tour includes a ferry transfer to one of three islands in the Chumphon Archipelago: Koh Tao, Koh, Koh Phangan, or Koh Samui. 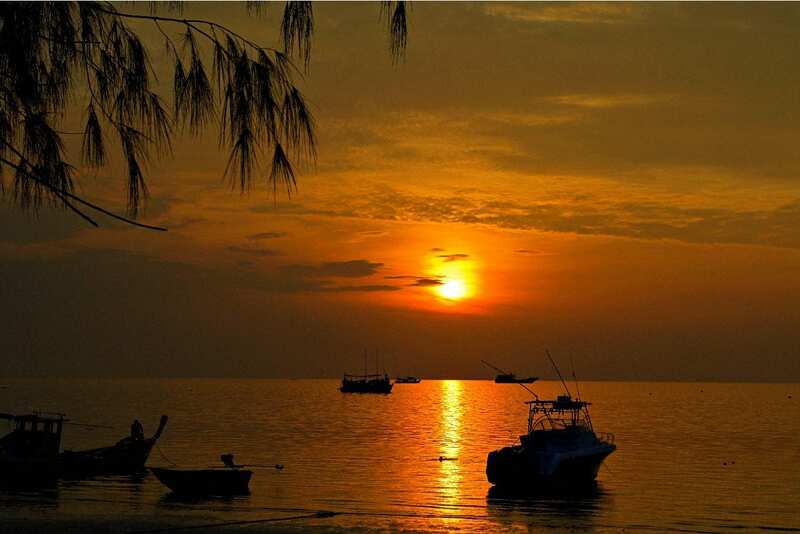 Koh Tao is a scuba backpacker island with some upscale properties on either end of town nestled between the jungle and the sea. 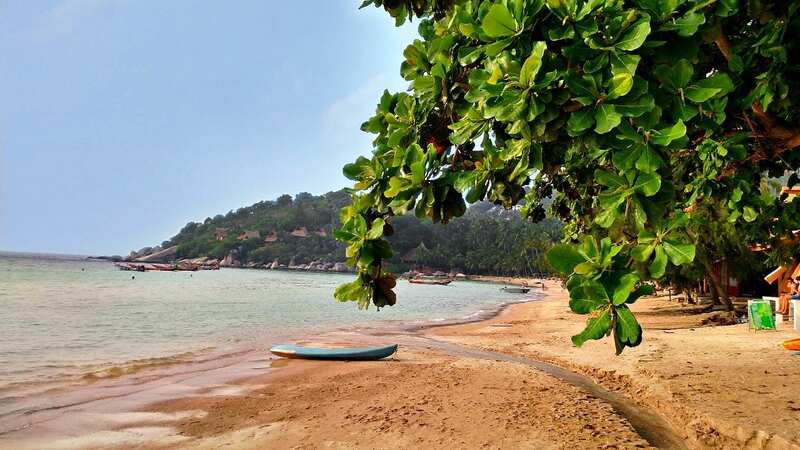 Koh Pha Ngan’s claim to fame is their full moon parties. If you loved the drinking and debauchery of Khao San Road, this could be the place for you, or maybe you just want to steer clear of the party crowd. 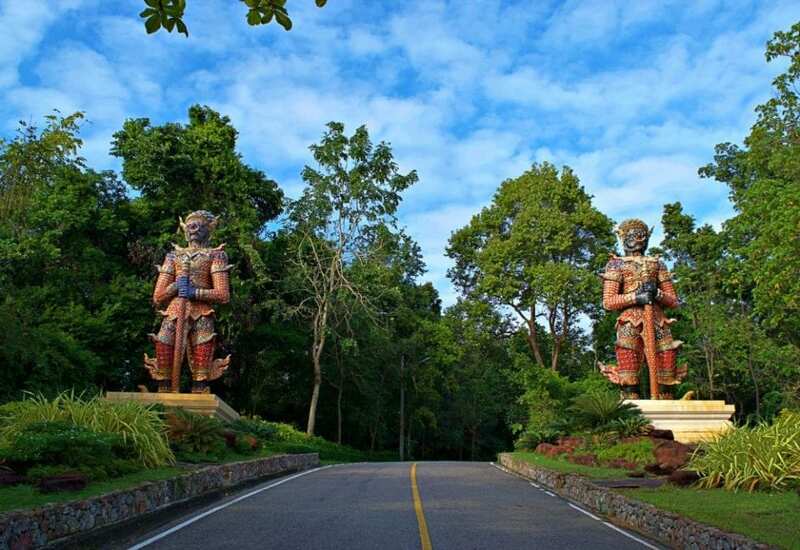 Koh Samui has the best-developed infrastructure and is the largest of the three islands. Unless you are planning a serious dive trip or absolutely love tropical islands, you’ll only need a day or two to recharge on the island of your dreams. 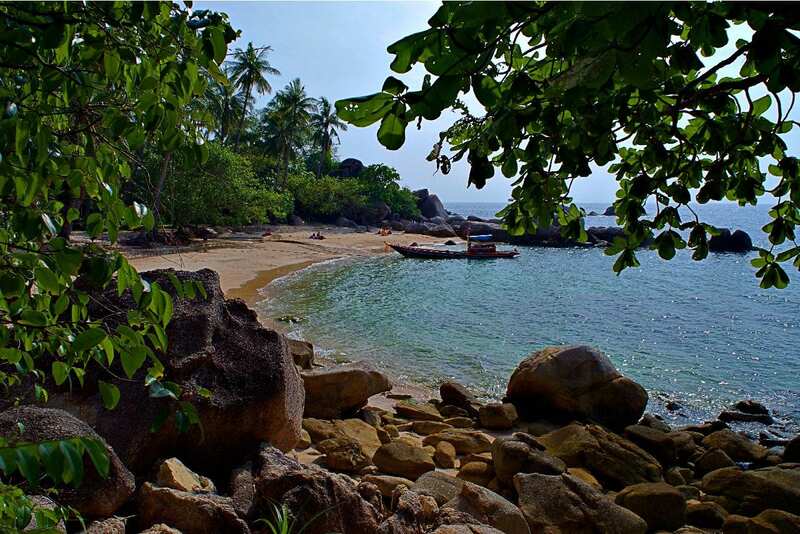 We choose Koh Tao because of its reputation as a dive center and the proximity to dive sites. It’s a great place to take dive training for sure, and everything is at a slightly lower price point than Koh Samui. 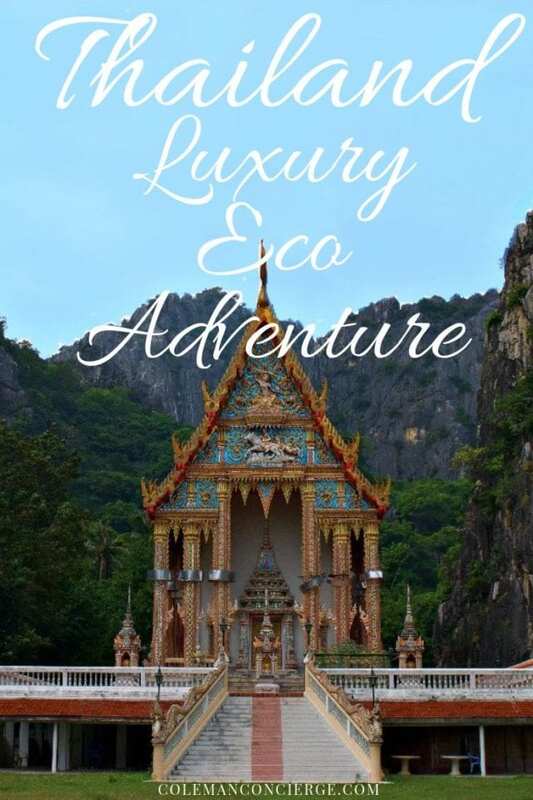 Koh Samui offers a more complete trip where you can still take a dive boat to Koh Tao but come back to developed tourism and even a waterfall hike. This trip segment is all about your self-guided adventure. 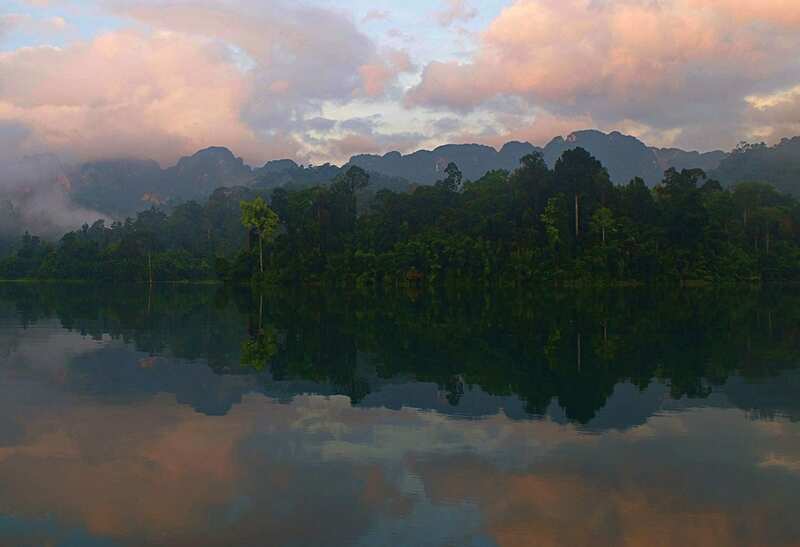 Dive safety note: The next part of the trip takes you into the mountains of Khao Sok. The local ground elevation is about 300 m which puts you right at the threshold considered a no-fly hold period. The atmospheric pressure at 300m is about 95% of sea level while at 2500m (equivalent cabin pressure of commercial airlines) is about 75% of sea level pressure. 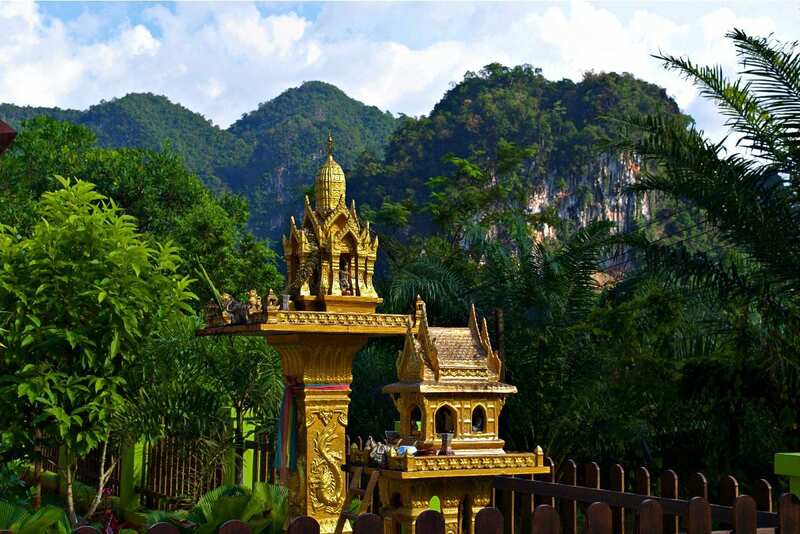 If you dove the morning before, you should be just about at 24 hours when your transportation climbs into the hills around Khao Sok. Do your research and decide if you need an extra day of rest after diving. If nothing else, drink plenty of water and be aware of the DCS signs as you ascend. What’s a visit to Thailand without seeing elephants? You should know by now that riding elephants is not considered cool. A good encounter consists of a little feeding, bathing, and play time. A few things make Elephant Hills different than any other elephant encounter out there. They are a fence free facility and have won multiple awards for conservation. 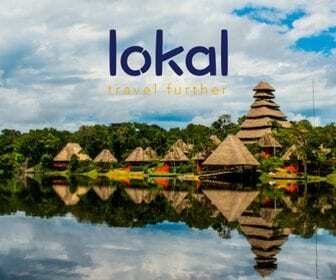 They offer a full tour package that includes cooking demonstrations, market tours, river trips with native guides, dances from local school children, cave tours, and more. During all of your time at Elephant Hills, you are glamping or glamorous camping. They don’t offer ordinary tents. Their tents have flush toilets, showers, and the most comfortable beds we slept in during our entire trip to Thailand (including the Bangkok Conrad). 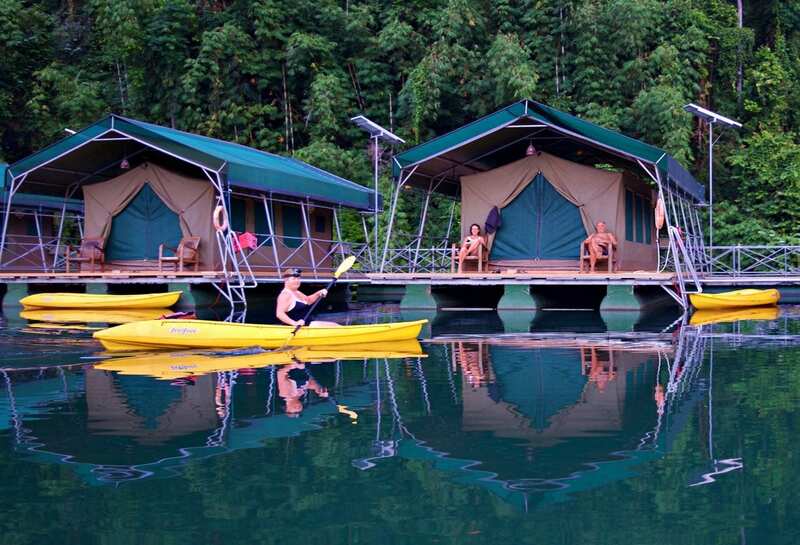 The glamping difference is that you fall asleep and wake up in nature. While this was special in the Elephant Camp, it was unbelievable at the Rainforest Camp. Our “tent” was on a floating platform in the middle of Cheow Lan Lake. We woke to families of gibbons chattering in the trees and explored through the morning mists on our private kayak that was docked just outside our tent. Having a gourmet Thai buffet for every meal was just icing on the cake. The Elephant Hills Adventure Package provides door to door transfers to and from Elephant Camp. You can use this to cross from the Gulf Coast of Thailand to Phuket, Krabi, and the Andaman Sea. Each coast is a little different and your trip to Thailand would be remiss without seeing Thailand’s west coast and the Phang Nga Bay. 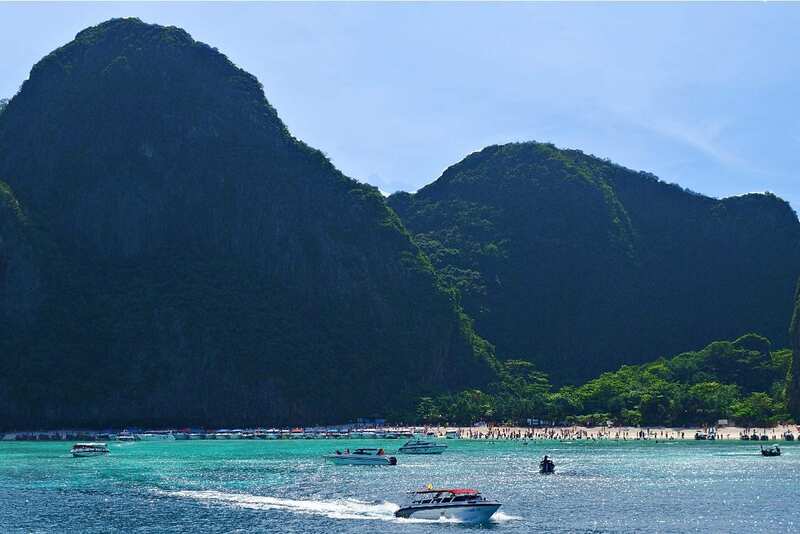 What makes the Andaman Sea different than the Gulf of Thailand? Karst Geology. The greater Phuket area has thousands of hotels, hundreds of beaches, dozens of islands, and two international airports (Krabi and Phuket). We have an easy way for you to make your plans. First off, check and see if you can get a flight home from Krabi or Phuket that is of reasonable cost and then plan accordingly. 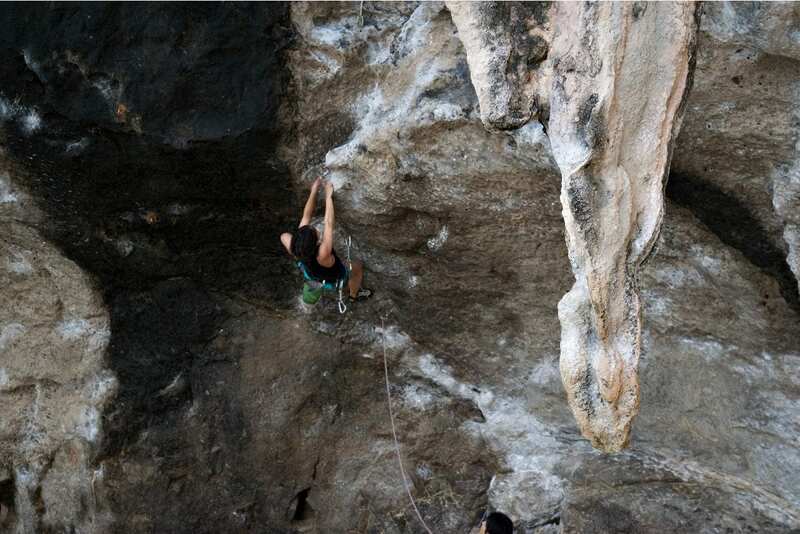 Second, if you are a high adventure adrenaline junkie who wants to climb karst towers, then make sure you end up in Krabi. Finally, if you have plenty of time, do what we did and island hop across the Andaman Sea and do both. No matter where you choose to go, Elephant Hills transportation will provide door-to-door service. Staying in Phuket, you have options too. Boutique resorts are located around the island, some have private beaches and are only accessible by boat. For the budget conscious, downtown Phuket has some good clean hotels and an interesting market scene but no beach access. In general, downtown is closer to the pier but farther from the airport. The beaches on the west coast of Phuket are an excellent middle ground. You have beach access and a hopping nightlife (perhaps too hopping for some). They are priced somewhere between the boutique resorts and downtown hotels. You’ll travel farther to the pier but have closer access to the airport. You can even rent a scooter and have your own one-day tour of Phuket. Picking your adventure is much easier. Our friend, @JenonaJetPlane found a beautiful day trip from Phuket around the Bay that included the major islands, kayaking, snorkeling, and cave exploration. It was her stories about the superb service she received that gives us the confidence to recommend this tour. Day dives are available from Phuket too that usually take you to the marine park near Phi Phi. We dove there and got to experience their resident very friendly turtle. It’s a bit of a motor over to Phi Phi but a lovely dive site once you get there. 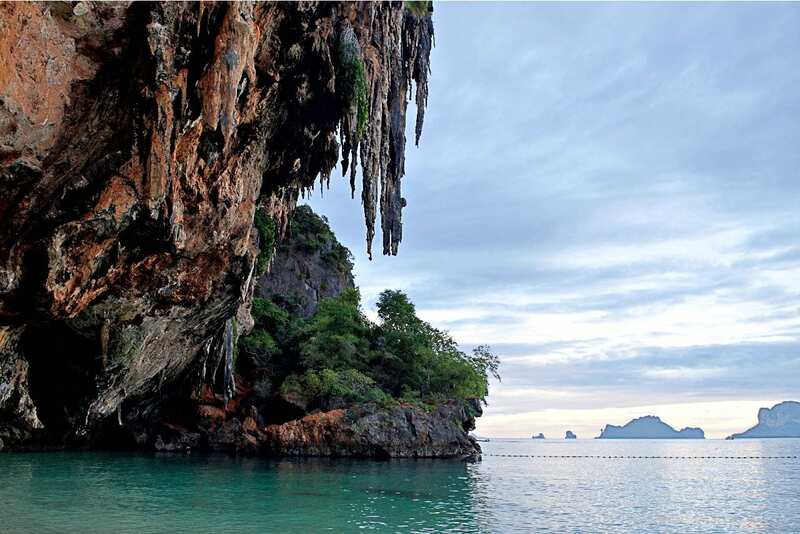 If you go to Krabi, we recommend staying near the Ao Nang Beach. 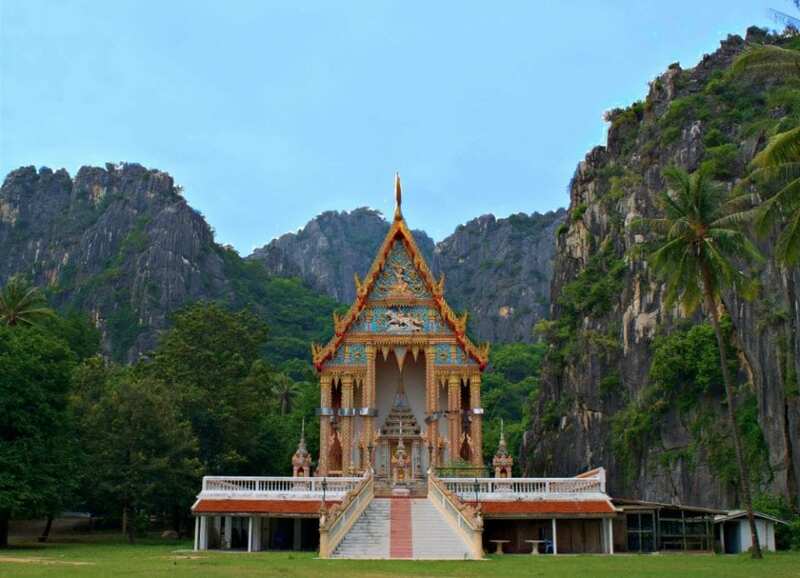 You’ll want to take a long tail boat over to Railay to explore the karst during your stay, but there are a couple of reasons to not stay in Railay. 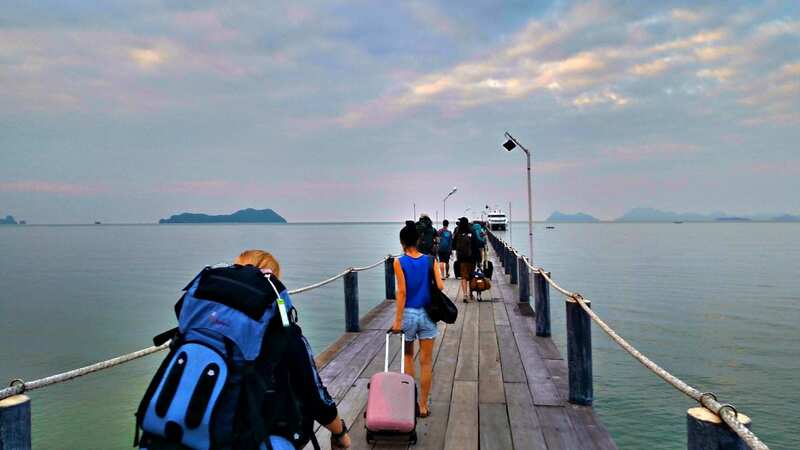 One, Railay is only accessible by boat, so it complicates the logistics to stay overnight. 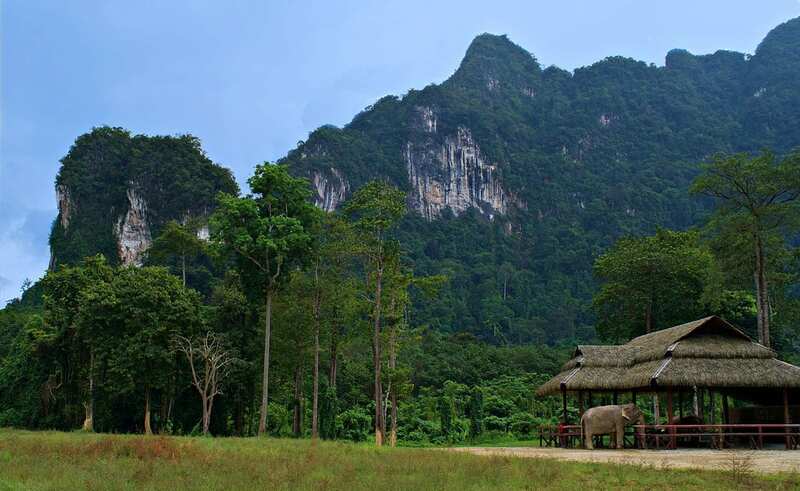 Two, you pay a premium to stay in Railay. Three, the water quality is notoriously bad… We can personally attest to the fact that Railay’s Revenge is real and the last thing you would want before a long flight back home. I, Ed, enjoyed the Krabi diving the most of all our Thailand diving. 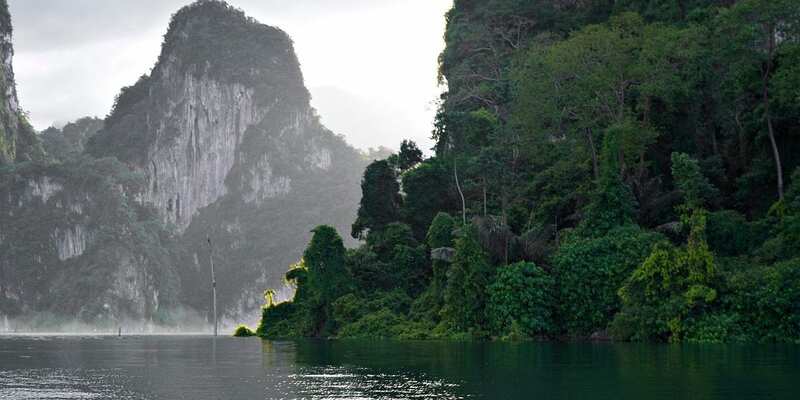 The karst features underwater provided gorgeous structure, and the boat ride out was terrific. 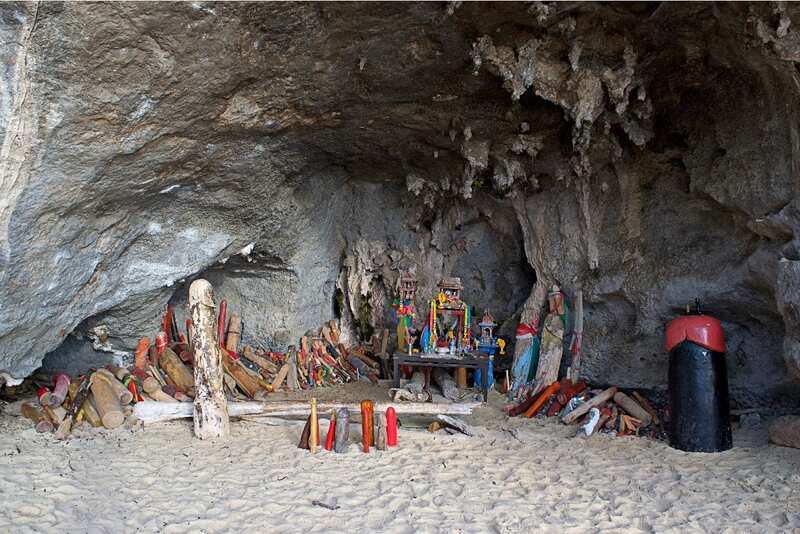 I also enjoyed visiting the caves, including the Instagram famous Princess Cave where locals leave phallus to gain her blessings as well as hiking through the exposed karst formations. If Jenn were feeling better, I would have talked her into a climbing or abseiling (canyoneering) trip, but she spent this time hiking between the bed and the bathroom and never really saw Railay. When our daughter visited, we had her stay in Ao Nang and make sure she was extra careful with food and water while visiting Railay. 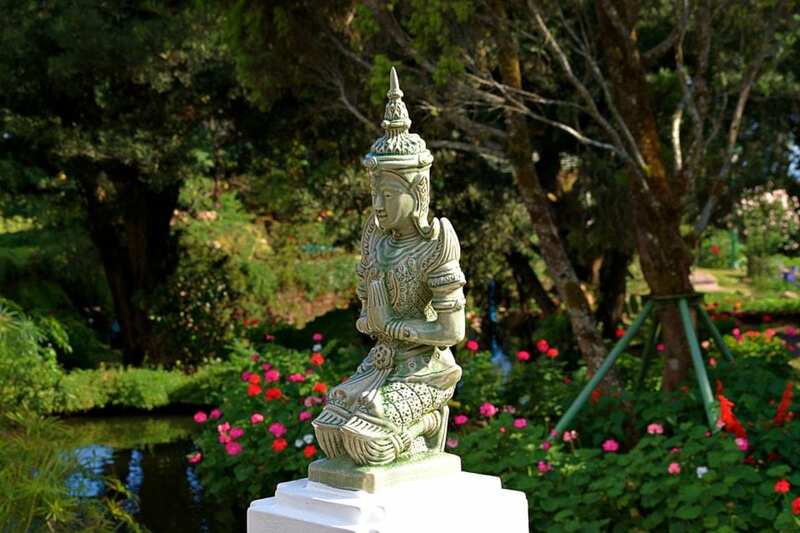 During each of our trips to Thailand, the next stop was to fly to Chiang Mai from Phuket / Krabi. The commuter air flights are super reasonable and convenient. 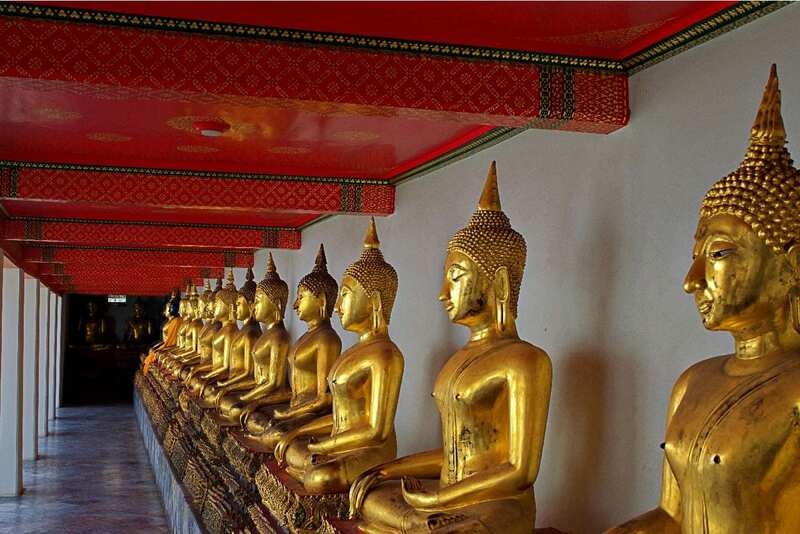 We also considered extending our Bangkok stay to visit the historic city of Ayutthaya. 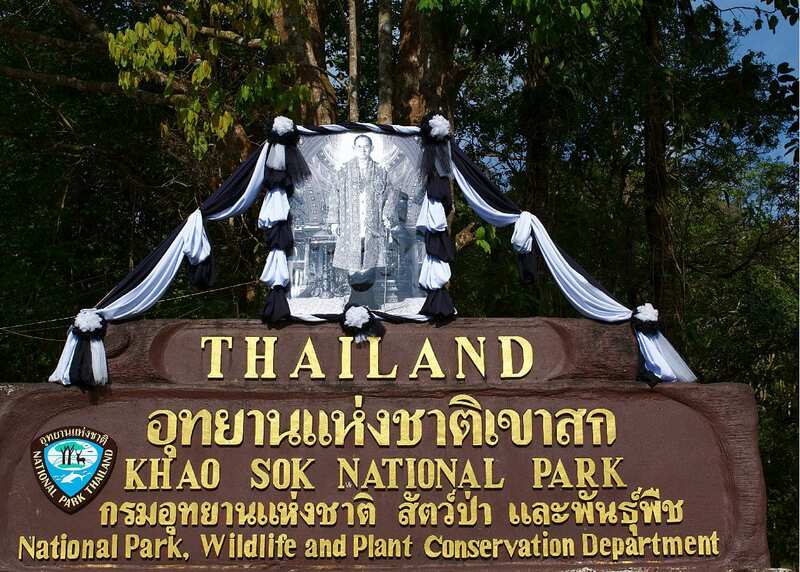 We did stay an extra in Khao Sok to hike the waterfalls and look for the 3m long Rafflesia Lillies in the jungles. This would mean that you could only take the Elephant Hills shuttle one way. 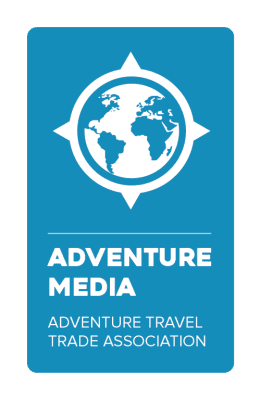 Sea Kayaking through the Phang Nga Bay sounds like fun too, especially if we got to see the Dugongs, which is Thailand’s version of the manatee. You could easily spend a month or two in Southeast Asia adding “one more thing” to your itinerary. It makes you wonder how come adults don’t get gap years too. This post is our answer to the age-old question, if you only had two weeks in Thailand what would you do? We would bike, dive, paddle, play, explore and do it all with the help of two of Thailand’s highest rated guide services. To make it easy for you to replicate, we put this itinerary into the table below and followed it up with useful links. 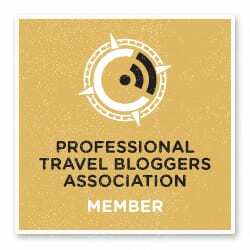 As usual for bloggers, we included our affiliate links that you can use to purchase these experiences with, and that will help support this site at no extra cost to you. However, pay or not, we will never compromise on our opinion about products, services, or providers. This trip will exceed your expectations and give you experiences to talk about for a lifetime.